POLASEAL M-A is a siloxane-based, single component waterproofing treatment for use on brick, stucco, block, concrete, stone, clay tile, slate, and exposed aggregate concrete. It penetrates the substrate and quickly cures to lock itself into the pore structure. POLASEAL M-A produces an incredibly durable barrier against the action of weather, pollutants, de-icing chemicals, and ultra-violet radiation, without altering the surface appearance. Can be used over mineral composites, masonry, porous stone and other approved surfaces. 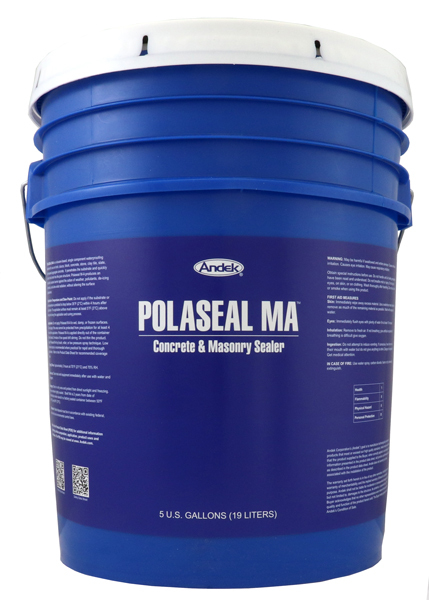 POLASEAL M-A is designed for application over untreated masonry surfaces. It is advisable to test any previously treated, painted or stained surface prior to application to insure compatibility. A test application is also recommended if exact coverage figures are desired. Surface to be treated must be clean and free of loose debris, dirt, mildew, oils and grease. All repairs and patchings should be allowed to age for 3 days prior to treatment. A dry surface is advantageous since it will allow maximum penetration of product into substrate. Apply POLASEAL M-A by brush, roller or low pressure spray technique. Low pressure spray is recommended where practical for rapid and thorough application. For a vertical surface, start at the top and work down. Fully saturate the surface with POLASEAL M-A. When spraying, apply enough material to generate a slight rundown of product. For a horizontal surface, start at one edge and work backward toward the opposite edge. Apply enough POLASEAL M-A to saturate the surface. Single coat coverage is suitable for nearly all applications. Extremely porous substrates or areas that have been experiencing heavy water infiltration may require a second coat. Apply a light second coat while the first coat is damp. Clean tools immediately after use with water and detergent. Do not apply to frosted or saturated surfaces. Do not apply if precipitation is forecast within 8 hours. Do not spray in strong wind conditions. Protect adjacent surfaces, including shrubbery, from overspray. Overspray may damage raw copper or aluminum surfaces. Remove any overspray from glass, metal or vinyl surfaces within 4 hours by wiping with thinner or mineral spirits, followed by wiping with glass cleaner. Store product between 38°F and 95°F.